What’s the difference, I got to musing, between a heritage and a legacy? Do you know? Well, I think a heritage is what you are entitled to get and a legacy is what you actually get. I actually got a heritage – a Woodland Heritage (WH), a happy experience among friendly and knowledgeable people in the magnificent surroundings of the Welsh Marches. Better still I was their guest! Woodland Heritage’s annual field trip this year was based in some of Britain’s best forestry country, around the market town of Welshpool. Some 70 members and guests started a fascinating tour, in wonderful summer weather throughout. Here Tom Till, agent to the trustees, and Andrew Bronwin, forestry consultant to the estate, met us. Both are fairly recent arrivals to a rich, well-stocked and productive woodland property which had persisted with traditional management, a resident head forester and direct employees, for a good deal longer than has been the general experience in these trying times. Costs had far outrun income, and trenchant action was required to bring the budget under control. Painful cuts had become necessary. Income needed to be generated. This was achieved by bringing the thinning programme up to date, and by some judicious felling of mature oak to supply a rejuvenated estate sawmill. We saw some fine veteran trees, some high quality young oak woods, all in a magnificent landscape. Woodland Heritage’s mantra is the slogan 'Action, not Words' and any estate entertaining their members is likely to get some good sound practical advice. This is because its membership includes such a wide range of expertise. So, after inspection and discussion, we learned how to deal with oak epicormics, how to set up a deer management plan, how to air-dry sawn oak in stick, how to organise a wood yard, what proportion of waste to expect when using sawn oak for quality furniture production and what market sectors to attack (and how) with oak products from the joinery shop. The accent at Powis is to try to add value to an already valuable product, and in so doing to use the inevitable high cost waste in rather more profitable ways. Industrial archaeology, in the form of a 120-yearold water-driven sawmill, complete with horizontal reciprocating saw, now sadly electric powered but still rocking on, seemed to present a tourist opportunity; this is now being pursued by the eager estate. The first afternoon took us to another fascinating spot, Trawscoed Hall, as guests of Mr and Mrs Trevor Trevor. Here, the owners explained how the shade of Grandfather Trevor, a formidable ex-director of the Indian Forest Service, still looked down sternly on a stunning wood of oak and beech, some of it 150 years old, interspersed with larch and silver fir, and carpeted with regeneration but blanketed with invasive laurel. The discussion then got round to the subject of genetics, and the WH-funded British and Irish Hardwood Improvement Programme, to climate change and its implications, and to the difficulties of Welsh farming in this day and age. Then we had tea at the house; very good it was too, while tennis enthusiasts snuck off into the kitchen to watch Murray vs Nalbandian. We paid our respects to a very ancient oak, a true veteran of perhaps a thousand years old, thanks were said, and the hospitable Trevor family presented with a nice turned sycamore fruit bowl. Next morning, the party reassembled at Leighton Estate Woodlands, owned by Mrs Lucy Shakerley, who sadly couldn't be present. However, her manager Callum Campbell could, as could consultant and former head forester the incomparable Harry Hindle, and the woodland staff. Inherited by John Naylor in 1849 and developed as a social and scientific experiment in Victorian hightec. The farm was run on recycling principles, the woods were home to amazing hydraulic inventiveness, a series of dams of varying degrees of efficacy, and networks of underground pipe work, with the centrepiece being a water-powered funicular railway, rising to the house on the ridge from the wooded valley below. I forget where it was that in the words of the hymn, (could it really have been Greenland’s Icy Mountains?) ‘every prospect pleases’, but on a sunny June morning it could very well have applied to the views over Leighton and the surrounding rolling, green Marches. But almost equally striking were the immaculately maintained woodlands running to some 900 acres. The pure quality of the plantations, growing in fine deep fertile sites is more than impressive. We saw wonderful stands of Coastal redwoods, stimulating a full history of the origin of the name Sequoia Sempervirens; suffice it to say that the true story is stranger and more poignant than any fiction. We inspected a 1.2ha plot of Metasequoia Glyptostroboides, the Dawn Redwood, and heard the true and the apocryphal story of its discovery in a remote monastery in China. 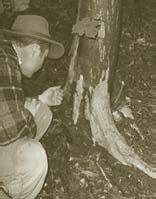 We had chapter and verse on Continuous Cover Systems, and discussed the reluctance of vigorous healthy Douglas firs to reproduce themselves by natural means. And we strolled in the park, an arboretum containing among many other wonders, the tallest tree in Wales, a Grand fir of 205 feet in height. We lunched in the Royal Forestry Society's Millennium Cabin, made from timber grown on the estate, with a redwood frame clad in larch and roofed with cedar shingles. 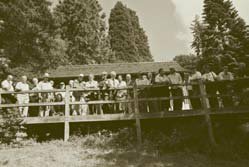 Mrs Torrill Freeman, daughter of C. P. Ackers, the eminent and innovative forester who presented the Leighton Redwoods to the RFS in 1958, donated the larch. Then David Williams, custodian and expert on the coastal redwoods, took us through the cool, columnar redwoods, growing, we were told, in drier and certainly less humid conditions than they really need, but growing to a huge size, even after allowing for the 30% of fibrous bark, with an awe-inspiring volume to the hectare. There followed a discussion on the merits of a wider public introduction into the grove, in itself a mighty powerful argument for British forestry. What an enjoyable and stimulating trip this turned out to be. Woodland Heritage clearly owes much to the dynamic Peter Goodwin, team leader, and his council, not least to his arachnoid networking among landowners, sawmillers, foresters, timber buyers, furniture makers, indeed all those concerned and interested in the growth and production of fine home-grown timbers. Winding up the meeting, Peter announced a very considerable coup that The Prince of Wales has agreed to become Patron of Woodland Heritage, a fitting tribute to the enthusiasm and drive of this friendly and cheerful group. Editor's note: The Trevors won no less than six awards at the Royal Welsh Show Woodland Competition, plus a new cup for the best entries in the conifer classes – donated in memory of the late Charles Shakerley of Leighton Estate, who memorably won an array of awards two years ago, before his untimely death.